I am a glass artist living in the heart of Northumberland, England’s most northern county. The pieces I produce rely on a combination of techniques. 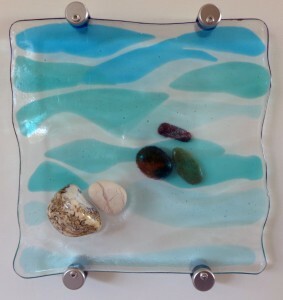 The glass is prepared by fusing material of different colours into a single sheet which is then relaxed into a mould to produce a textured finish. My work is inspired by the Northumberland coast and countryside and the plants which thrive there. Many pieces are site-specific, involving the incorporation of rock material from a particular location giving the pieces a particular regional resonance. Many of my pieces are also mounted in local stone adding further a reference to their inspiration.